A history of ‘share prices’ going back to the Middle Ages. You know – back when things were so much nicer because there wasn’t a Central Bank. Why yes – yes that was some snark. There were not a lot of publicly-traded shares in the Middle Ages (specifically, this chart begins with the stock index in Genoa – which was once important, but is now just the sixth largest settlement in Italy). Just a few things, like the Industrial Revolution, the second Industrial Revolution, the Digital Revolution, Electrification, and the discovery of penicillin. Also: workers’ rights, globalisation, and the invention of a Middle Class. The Federal Reserve, and all the other Central Banks, are the great evil of the world. With their money-printing and loose monetary policies, they have wrought credit bubbles and busts that have destroyed the world we live in. Look at these share prices. 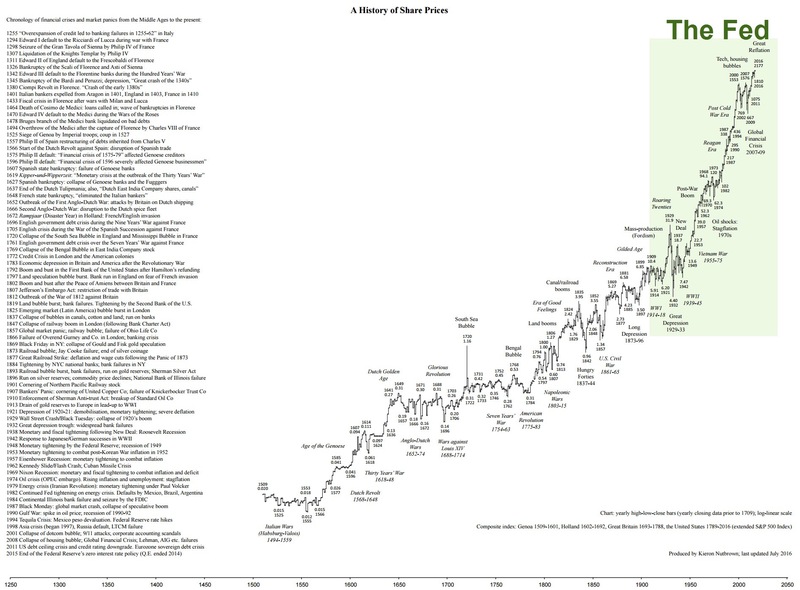 We were following a trend, and now they’ve created a century-long bubble of stock prices. Just wait for that reversion to the mean. Globally-speaking, an affluent middle class has emerged in the last century. They’re asset-owners, albeit on a smaller scale than the wealthy, but they have access through grand communal mechanisms like Medical Aid Schemes to all the marvels of modern medicine. Did you notice how the spike in life expectancy seemed to precede the spike in stock prices? The problem with affluent people living longer is that they start to worry about things like retirement. Before this, perhaps children were their retirement policy. But no more – now it’s about independence and pension funds. So what happens when you have all this money being poured into pension funds and saving funds in search of an investing home? Well, asset prices go up. As asset prices go up, you get other companies coming to the stock market to sell their future returns for cash. And before you know it: the Financialisation of the world. Fortunately, this all took place alongside the Scientific-Technical Revolution, where we learned how to be more productive: in agriculture, mining, transport, everything. So there were returns to be had. And with more people doing more consuming with methods that were more productive than ever before, there was room for investment, and for those large corporations to develop that could absorb the retirement savings of this rising middle class. Question: is it really that surprising that we’ve seen higher-than-historical rises in share prices? Or should we rather blame the Federal Reserve for their inflationary ways?